Robin D. Stone is a New York City based psychotherapist, coach and consultant who works to help you achieve your most optimal self. Books That Will Get You Cooking! A new year brings new intentions, and one way to get intentional about your well-being is to consider not just what you eat but how and why. You can do that by getting to know the history and healthy interpretations of your food. Cookbooks – and books about cooking – are great not just for recipes, but also for understanding cultural and collective history, or how we come to eat what we do, and why. The more you know about Afro-inspired cooking, the more you understand how our legacy goes beyond the poverty cooking of the plantation and includes the high art of infusing fresh, flavorful ingredients with creativity and hints of home – wherever home may be. In The Jemima Code, Toni Tipton-Martin, an award-winning food journalist and activist, explores her huge collection of rare cookbook titles from the early 1800s to the late 1980s. Though Black women have always had an integral role in the cultural history of food and cooking, we have often been written out of that narrative, relegated to servitude in Big House and behind the closed doors in White Folks’ kitchens. Martin looks beyond ingredient lists and instructions to reveal culinary competencies and artistry, and shows much love for the intuition that Black women have used in their cooking for centuries. Author Nicole A. Taylor, a Georgia native, mixes her Southern taste buds with the Brooklyn foodie scene, bringing a fresh eye and a modern twist to recipes like Grits with New York State Cheddar and Blue Cheese, Collard Greens Pesto with Pasta and Apple and Bok Choy Salad. Sweet or savory, you’ll find pages of downhome favorites. As their website shares, the mother-daughter duo of Alice Randall and Caroline Randall Williams “reclaims and redefines soul food by mining the traditions of four generations of Black women and creating 80 healthy recipes to help everyone live longer and stronger.” Rich in family lore and favored dishes like DeFord’s Spicy Roasted Sweet Potatoes with Pomegranate, Soul Food Love is an affirming, intergenerational look at food, health and history. 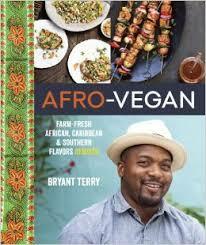 Whether cooking inspiring and hearty meals for crowds or packing a lunch for his daughter, Bryant Terry, an award-winning chef, educator, food justice activist and author based in San Francisco, brings bold flavor and color to the plate. With recipes like Crispy Teff and Grit Cakes with Eggplant, Tomatoes, and Peanuts, which combines the Ethiopian grain teff with grits from the Deep South and North African zalook dip, Terry reimagines familiar dishes and serves them up with a nod to their global origins. A great option for meatless Mondays and beyond. Share your email address to receive news and updates. I respect your privacy and will not sell or share your contact information.